American Hustle | What is Ann Watching? by dvdiva in Contemporary, Film Tags: American Hustle, Amy Adams, Bradley Cooper, Christian Bale, David O. Russell, Jennifer Lawrence, Louis C.K. I found myself home alone recently and took the opportunity to catch a movie. I decided on catching up with the Oscar contenders. Because I really enjoyed Silver Linings Playbook, I chose American Hustle as it shared a director and several actors. The fact that my friend Karen recommended it didn’t hurt either. Well the title says it all! This was a good film about a wild scam, a fictionalization of infamous Abscam, actually. Everyone seemed to be conning everyone else and I had no idea how things would resolve until the satisfying end. It was a good film, not a great film and I was surprised at all the Oscar hype. I usually enjoy a good grifter movie, especially if it is done in a film noir style. 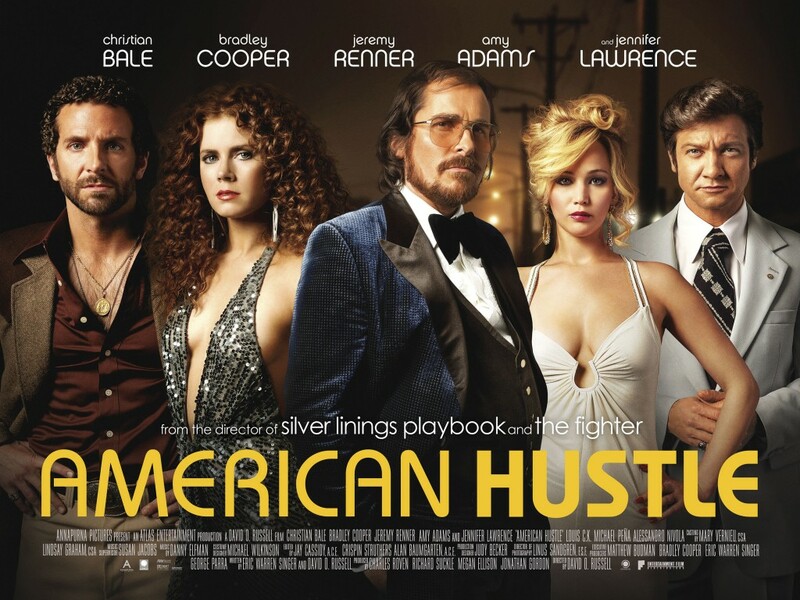 American Hustle was not filmed with typical film noir elements. Rather it was done as a period piece, taking place in the 70’s, at the height of the polyester disco era. Which for some, would lend some nostalgic charm. This was a film about 2 scam artists, Irving Rosenfeld (Christian Bale) and Sydney Prosser (Amy Adams). This star-crossed pair was nabbed by an eager young FBI agent, Richie DiMaso (Bradley Cooper). In lieu of jail time, the pair of hustlers were coerced into cooperating with DiMaso’s scheme to lure and then take down corrupt politicians, mobsters and other high rollers. Quelle surprise, things did not go according to plan and chaos ensued. The soundtrack and costumes were spot on and transported me back in time. The acting was good, really, really good. The 3 main leads were transformed and convincing. Additionally, I enjoyed Louis C.K. as Bradley Cooper’s reluctant FBI supervisor. The poor man didn’t know where to look before he was reluctantly dragged into DiMaso’s plan. Jennifer Lawrence did a phenomenal job in a pivotal role that had surprising little screen time, as Bale’s volatile neglected wife. There were comedic elements in this film (Christian Bale’s character’s ridiculous comb-over comes to mind) but they were far too few. The dialogue was witty at times. So why did I think this film was good and not great? I guess it was because there was very little character development, at least not enough for me to care about the fates of anybody. With a film focused on people doing despicable things, the onus is on the director (David O. Russell in this case) to persuade me to care about what happens to those people. Some times I don’t care but the laughs along the way or the clever plot twists are enough to wow me. Not in this film. It often boils down to relatability, which, granted, is entirely personal. Still glad I saw it and I would definitely watch it again. And I probably will, as I know my husband wants to see it. Who knows? I might have missed something and reserve the right to be wowed after a second viewing.